The knees are such an integral part of the body. From routine activities, such as driving and walking, to more demanding movements, such as playing sports, they allow us to live life fully. When one of them is injured, the limitations on what you can do are many. Two of the most common knee issues involve torn ligaments; specifically the ACL and the MCL. Yet, unless you work within the medical field, it can be confusing as to which is which and how to treat them. In aims of helping you better understand the anatomy of your knees, below is a basic analysis of the differences between an ACL and an MCL tear. The human knee is composed of the femur (the thigh bone), the tibia (the shin bone), and the patella (the round part of the knee). All these bones are held in place by several ligaments. These include the Anterior Cruciate Ligament (ACL) and the Medial Collateral Ligament (MCL). The ACL runs diagonally in the front of the knees, connecting the femur to the tibia. Due to its location, it’s the knee ligament that’s most prone to injury. The MCL is located on the inner sides of your knees. They are most likely to tear when a person receives a hard blow to the outside of the knee. Which Is Worse: An ACL or an MCL tear? Both types of injuries are painful, and since ligaments are meant to provide joint stability, either type of injury will impair a person’s mobility. The limitations vary depending on which ligament was injured. However, while both cause a lot of discomfort, technically speaking, an ACL tear could be considered as worse, since it may require surgery to fully heal. On the other hand, a minor MCL tear can heal on its own. ACL Tear: It’s common for a person to actually hear a popping sound when he or she tears an ACL. They will also experience an immediate shooting pain. If the ligament is completely severed, the person won’t be able to place their full body weight on the knee, since the joint becomes unstable. MCL Tear: When a person injures their MCL, they will experience similar symptoms as to those of an ACL tear. However, in addition to the shooting pain, swelling, and inability to carry the body weight, the person will also feel like they have a locked knee. How To Tell The Difference Between an ACL and an MCL Injury? If the pain is on the inside of the knee, the injury is likely an MCL tear. However, since the symptoms are so similar, always seek medical attention as soon as possible to rule out additional injury and to obtain adequate treatment. ACL tears tend to occur when a person does a sudden movement, such as changing directions quickly, landing from a jump incorrectly, or suddenly stopping. Can You Walk on a Torn ACL or MCL? Either type of injury will limit a person’s range of motion. 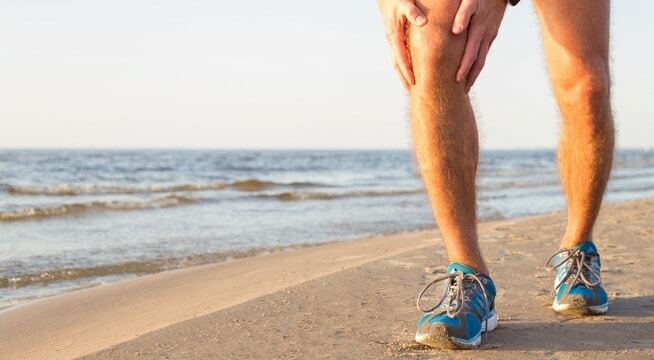 If the injury is severe enough, the person will feel instability of the knee, which makes walking difficult. And if the ligament is completely torn, the person will not be able to walk until the injury heals. For an ACL Tear: Treatment for an ACL tear will vary on two main factors: (a) The severity of the injury, and (b) the patient’s lifestyle. For minor injuries or for a person who has either a sedentary lifestyle or low activity level, conservative treatment such as physical therapy may suffice. However, an athlete and/or someone with a fully torn ligament will need surgery. For an MCL Tear: Minor MCL injuries heal on their own. Home remedies include icing the injury for 15 to 20 minutes at a time, resting, wearing a compression sleeve, and keeping the injured leg elevated. While surgery is highly unlikely, you should still go to the doctor for a thorough examination of the injured joint to avoid complications. While some injuries are hard to prevent, you can lower the likelihood of an ACL tear by warming up and doing stretching exercises before playing sports. Also, stay hydrated and pay close attention to proper nutrition for your sports of preference. This will prevent muscle fatigue and a change in athletic form. To lower the risk of suffering from an MCL tear, always wear protective gear when playing sports and do strength training exercises so that your leg muscles can take some of the stress placed on the knee joint. If you’ve injured a knee, let us help you. If you have questions or need immediate treatment, your nearest Complete Care location is ready to help, no matter the time of day or night. We offer a variety of services to help you and your family in your time of need. No appointments are necessary.